In a classic game-show version of "Hangman," contestants solve word puzzles for cash and prizes. Serengeti National Park. Group of African Elephants with Baby (Loxodonta africana). Tanzania. The elephant staggered and keeled over in the tall grass in southern Tanzania, where some of the world's worst poaching has happened. It wasn't a killer who targeted her but a conservation official, immobilizing her with a dart containing drugs. Soon she was snoring loudly, and they propped open her trunk with a twig to help her breathe. They slid a 26-pound (12-kilogram) GPS tracking collar around the rough skin of her neck and injected an antidote, bringing her back to her feet. After inspecting the contraption with her trunk, she ambled back to her family herd. The operation was part of a yearlong effort to collar and track 60 elephants in and around Tanzania's Selous Game Reserve, widely acknowledged as "Ground Zero" in the poaching that has decimated Africa's elephants in recent years. The Associated Press traveled to the area to witness how the battle to save the continent's elephants is gaining some momentum, with killings declining and some herds showing signs of recovery. 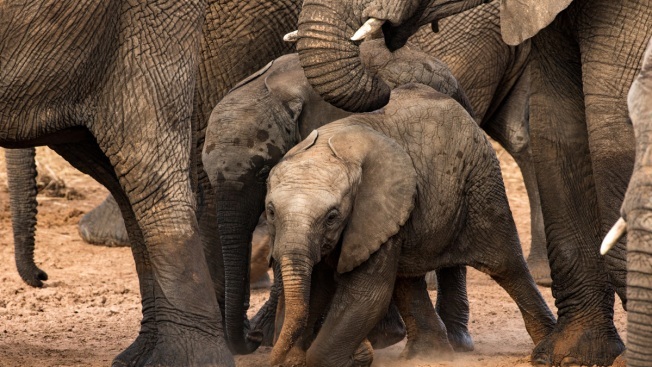 Legal ivory markets are shrinking worldwide, and law enforcement has broken up some key trafficking syndicates, say experts. But it's far too early to declare a turnaround. Poachers are moving to new areas and traffickers are adapting, aided by entrenched corruption. The rate of annual elephant losses still exceeds the birth rate. And the encroachment of human settlements is reducing the animals' range. 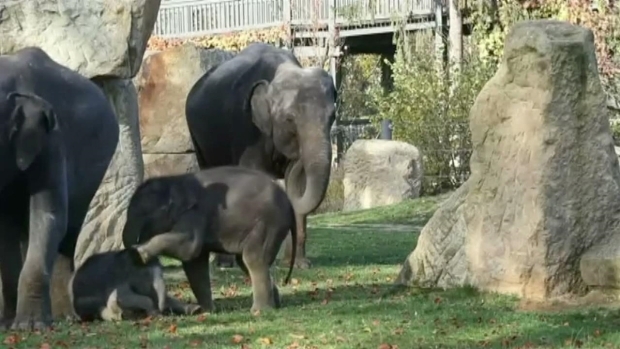 Two baby elephants born at The Prague Zoo have gone on public display. "The trend in poaching is going in the right direction, but we have a long way to go before we can feel comfortable about the future for elephants," said Chris Thouless of Save the Elephants, a group based in Kenya, where elephant numbers are rising again. In a move to crack down on demand, Britain this month announced a ban on ivory sales. In China, trade in ivory and ivory products is illegal as of 2018. And in the U.S., a ban on ivory apart from items older than 100 years went into place in 2016. If poaching can be brought under control here in Tanzania, there is hope that the killing of elephants can be stemmed elsewhere on the continent. Africa's elephant population has plummeted from millions around 1900 to at least 415,000 today. Intelligent and emotional, with highly developed social behavior, elephants have been hunted for their ivory for centuries. A ban on commercial trade in ivory across international borders went into effect in 1990, but many countries continued to allow the domestic buying and selling of ivory. Increased demand from consumers in China fueled a new wave of killings. In Tanzania alone, the elephant population declined by 60 percent to 43,000 between 2009 and 2014, according to the government. Much of the slaughter happened in an ecosystem comprising the Selous and the adjacent Mikumi National Park. A tourist guide told The Associated Press that several years ago, he and a client saw an elephant family at sunset in the Selous reserve. They returned the next day to the ghastly sight of carcasses of elephants slaughtered for their tusks. A five-day-old baby elephant named Joy made her debut at the Houston Zoo on Monday. The Asian elephant calf weighs 305 pounds. Her 26-year-old mother Shanti gave birth to her after a two-year pregnancy. The killings in Tanzania appear to have slowed down. A count in the Selous-Mikumi area last year added up 23 carcasses of poached elephants, just 20 percent of the number found four years earlier. And African elephant poaching has declined to pre-2008 levels after reaching a peak in 2011, according to the Convention on International Trade in Endangered Species. It's a positive trend, but there is speculation there is a dearth of elephants to kill in many areas. "All the 'easy' elephants are dead," said Drew McVey, East Africa manager for the WWF conservation group. In Tanzania's Selous region, more newborn elephants are visible and confident elephants are moving more widely outside unfenced, officially protected areas, said Edward Kohi, principal research officer with the state Tanzania Wildlife Research Institute and leader of the GPS collaring program funded by WWF. The collars are designed to allow rangers to track the movement of elephant herds, and then mobilize to protect them if they move into poaching hotspots. By receiving satellite-transmitted data on mobile phones, rangers could also intercept elephants that drift into a human settlement or fields of crops. Adam Rajeta, a farmer and cattle herder living next to Mikumi park, said elephants sometimes cause havoc. "During the harvesting season, they come close to our homes," Rajeta said. "When they do, we beat drums and make noise to scare them and thus protect ourselves. Only with God's mercy do they leave our neighborhood." Strong currents carried an elephant offshore near Sri Lanka Tuesday and the local navy sprang into action to save it. A team of divers was able to carefully direct the elephant toward the coast from deep water using ropes. Once safely ashore, the animal was handed over to local wildlife officials for observation and care. There has also been movement to crack down on trafficking. Tanzanian President John Magufuli, who took office in 2015, took a hard line and authorities have arrested key suspects linked to trafficking syndicates. However, the fight against the illegal ivory trade is like squeezing a balloon — when gains are made in one area, such as Tanzania, the killings intensify in another spot, like Mozambique's Niassa reserve to the south, which is linked to the Selous by a wildlife corridor. And international seizures of smuggled ivory appear to be as large as ever, a possible sign of hurried efforts by traffickers to move stockpiles before business gets too difficult. Some poaching gangs in Niassa are Tanzanian and "there is a lot of movement across the border" that includes other illicit trade, including in timber and minerals, said James Bampton, Mozambique director for the New York-based Wildlife Conservation Society. The group co-manages Niassa with the government. There are probably fewer than 2,000 elephants in Niassa, Bampton said. That's a small fraction of the estimated number a decade ago in Mozambique's main elephant refuge. Periodic thefts of confiscated ivory and rhino horn in Mozambique also raise concerns about official collusion with traffickers. Another worrying development is evidence of increased processing of ivory tusks into jewelry and trinkets within Africa, instead of the old method of shipping raw ivory out of the continent. This allows traffickers to transport ivory in smaller quantities that are hard to detect and avoids increased scrutiny of ivory-carving operations in Asia. The challenges of protecting wildlife were apparent to AP journalists who traveled with the collaring team in Mikumi park next to the Selous reserve, a U.N. world heritage site. A baby elephant was saved from drowning by a group of its family members at a South Korean Zoo. 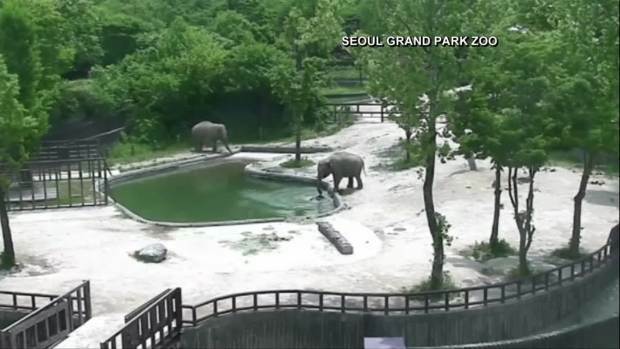 In a video recorded by the Seoul Grand Park Zoo, a baby elephant named Hope tried to drink from a pond, but somehow lost its balance and fell in. The calf's mother and aunt came to the rescue, first trying to reach it with their trunks, then going in the water and holding the scared calf up. They eventually brought the calf back to land. A third adult elephant was seen pacing back and forth in a separate enclosure, appearing alarmed by the situation. Plans to deploy a helicopter to help spot and herd the elephants fell through. Vehicles got stuck in mud. One morning, a startled wildlife official sprinted to his vehicle after briefly entering a toilet labeled "Gents" at a dirt airstrip. A female lion who had been reclining in a stall sauntered out. The team sometimes tracked elephants on foot, studying big round footprints, broken branches and the freshness of elephant dung for clues to their whereabouts. Just two out of a planned five elephants were collared over three days in the Mikumi park. The conservationists refrained from darting elephant matriarchs, instead choosing younger females that they know will follow the group. They also intend to collar often solitary bull elephants. The elephants displayed their social bonds in one instance, retreating into a defensive circle after hearing the pop of the dart gun. When a female was hit, the others appeared to try to prop up their woozy companion before fleeing. Suspected traffickers are a threat to more than elephants. In August 2017, conservationist Wayne Lotter, credited with helping Tanzanian authorities dismantle some ivory smuggling operations, was murdered in Dar es Salaam in an apparent hit. Eight people have been arrested for the murder, including two bank officials and several businessmen. Tanzania's Selous-Mikumi region is known as one of the biggest killing fields for African elephants, but the vast wilderness of about 23,000 square miles (60,000 square kilometers) still offers hope for the world's biggest land animal. In 50 to 100 years, said Kohi, the collaring team leader, "when the human population is skyrocketing, this will be one of the important areas for the conservation of elephants." This story is part of NBCUniversal’s 11th Annual Green is Universal Earth Week where we’re inviting our viewers and readers to show us how Earth inspires them by sharing their work in the community using the hashtag #EarthInspiresMe. Follow on Facebook, Twitter and Instagram for more.